Governance, Risk Management, and Compliance shows senior executives and board members how to ensure that their companies incorporate the necessary processes, organization, and technology to accomplish strategic goals. Examining how and why some major companies failed while others continue to grow and prosper, author and internationally recognized expert Richard Steinberg reveals how to cultivate a culture, leadership process and infrastructure toward achieving business objectives and related growth, profit, and return goals. 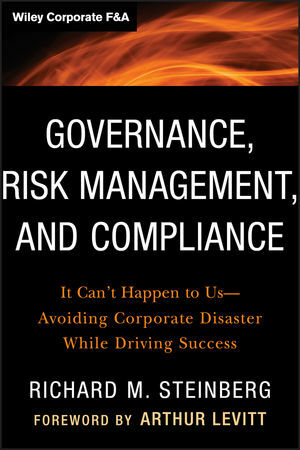 Governance, Risk Management, and Compliance lays a sound foundation and provides critical insights for understanding the role of governance, risk management, and compliance and its successful implementation in today's business environment. RICHARD M. STEINBERG is founder and CEO of Steinberg Governance Advisors, Inc. He is a nationally recognized expert on governance, risk, and control, and advises boards of directors of major multinational, large, and middle-market companies. He is a former senior partner of PricewaterhouseCoopers (PwC) and the leader of its corporate governance advisory practice. As an expert in internal control and risk management, Steinberg served as the lead project partner in developing the Committee of Sponsoring Organizations of the Treadway Commission's (COSO's) Internal Control—Integrated Framework, and led development of COSO's Enterprise Risk Management—Integrated Framework, the landmark reports recognized as standards for effective internal control and risk management. He has been featured on CNBC's Morning Call and Bloomberg TV's Bloomberg on the Markets and The Bloomberg Report; has guest-lectured at leading business schools including Columbia, MIT, and NYU; has been quoted in publications such as BusinessWeek, Fortune, the Wall Street Journal, Dow Jones MarketWatch, CNN Money, and the Financial Times; and is a monthly columnist for Compliance Week.